Broken screws are a pain to remove, but the ABN Screw & Bolt Extraction 25-Piece Remover Tool Kit makes it a simple process. Extract broken fasteners and studs from bolts, nuts, and screws without breaking or jamming. This set takes out any fastener with thread sizes from 3/16 to 9/16 inch. 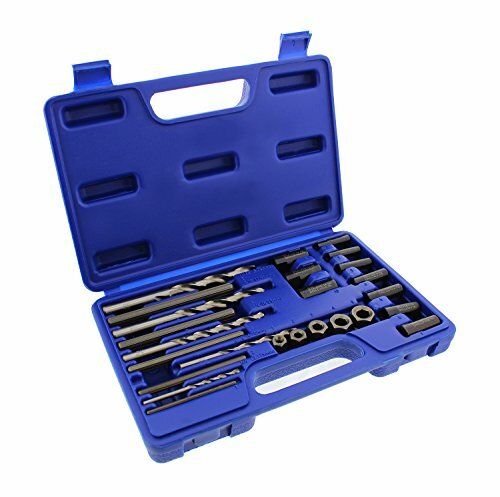 For ultimate strength and highest torque without expansion, the tools in this kit are constructed from steel with different finishes. These extractors grip the inside of the drilled hole when turned in the direction for backing the broken screw out. They release when turned in the opposite direction. This package includes 5 drill bits, 5 extractor pins, 10 drilling guides, 5 extractor nuts, and 1 carrying case for your convenience. WARNING: This product can expose you to chemicals which is [are] known to the State of California to cause cancer and birth defects or other reproductive harm. For more information go to www.P65Warnings.ca.gov.